Badge stickers can be customized for your security company or shopping mall complex. 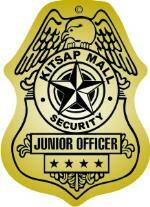 Junior officer badge stickers are ideal for private security companies, community and mall events. Junior security badge stickers are printed on white gloss stock, shiny gold foil or shiny silver foil. Made and Printed in the USA. #S-1 STICKER SIZE: 2-3/16" x 3"
#S-2 STICKER SIZE: 2-1/4" x 3"
#S-5 STICKER SIZE: 2" x 3"